For all things Notice & Note, visit Heinemann.com/NoticeAndNote. You'll find blog posts, videos of Kylene and Bob, community features, and more. "Just as rigor does not reside in the barbell but in the act of lifting it, rigor in reading is not an attribute of a text but rather of a reader's behavior-engaged, observant, responsive, questioning, analytical. The close reading strategies in Notice and Note will help you cultivate those critical reading habits that will make your students more attentive, thoughtful, independent readers." 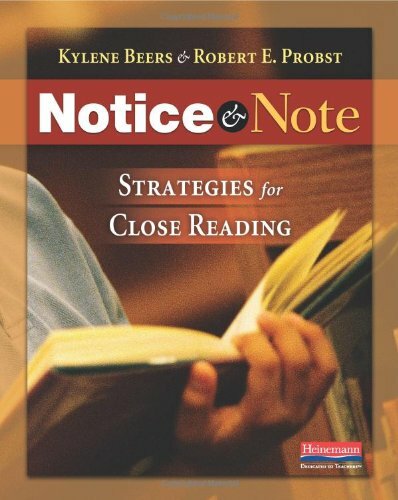 In Notice and Note Kylene Beers and Bob Probst introduce 6 "signposts" that alert readers to significant moments in a work of literature and encourage students to read closely. Learning first to spot these signposts and then to question them, enables readers to explore the text, any text, finding evidence to support their interpretations. In short, these close reading strategies will help your students to notice and note. A new Notice and Note Literature Log offers students practice finding the signposts-with over-the-shoulder coaching from Kylene and Bob. Save with 5-packs.